Whole Villa Rental: Angel House Ubud 3 suites. – Angel House Ubud. Boutique 3 suite hotel or Whole Villa Rental. Authentic Bali experience. Unique Accommodation. 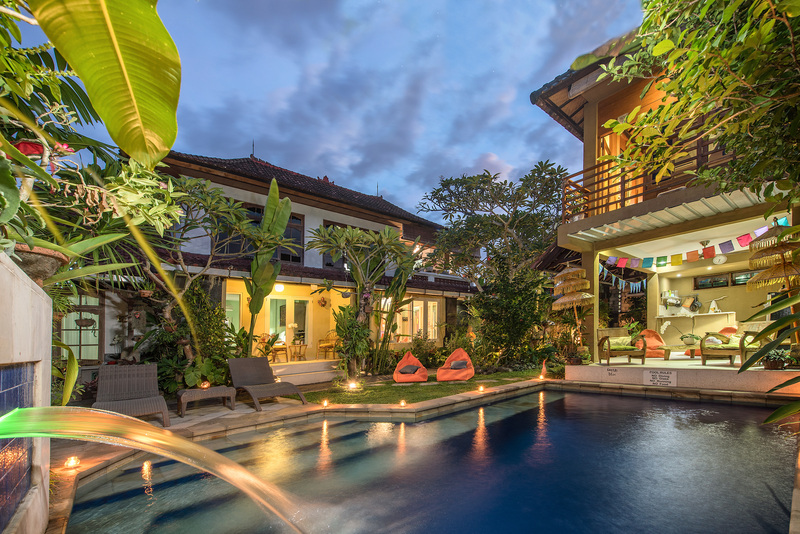 Whole Villa Rental: Angel House Ubud 3 suites. Holidaying in Ubud with a group of friends or with your family? Then booking all 3 guest suites at Angel House may be the perfect way to enjoy your own villa in Bali with privacy and space. Angel House is LGBTQ friendly. Angel House sleeps 6 adults (or 2 children) in comfort with all 3 rooms booked (Whole Villa Booking). Children under 10 can be accommodated in the Sandat suite on the double sofa bed. This room can also accommodate 1 extra single bed. Angel House offers a beautiful pool, all set in a glorious tropical walled garden, private verandas on all guest suites and, with a guest kitchen, you can make a snack or drink at any time. There is a spacious living & dining area, guest library with books and games, swimming pool (1.6m deep), fish ponds and traditional Balinese Temples. Included is; freshly cooked breakfast, complimentary unlimited filtered drinking water, Hi Speed WiFi, recycling and composting service, daily housekeeping, plus daily ‘blessings/offerings’ to our house temples; you are welcome to take part. We are a 5 minute walk from the main fresh produce market of Pasar Mas and its night market (Mas market) and a short stroll into the tourist village of Tarukan Mas, 3 local supermarkets, restaurants, ATM, art galleries, coffee shops, organic restaurant with yoga shala and cooking school, and a hospital with pharmacy and 24hr Emergency department. We are situated in a quiet village street, only 15 mins to the centre of town, with its myriad of shopping and eating choices – but far from the maddening crowd. We can configure bedding to suit your group’s individual requirements. With our dedicated staff to take care of you no one needs to lift a finger. A delicious fresh cooked breakfast for all guests, including juices, fresh fruit is available each morning. A snack menu is available throughout the day and many of the excellent café and restaurants deliver to our door. Make Angel House yours – and let us make it a holiday to remember! Jepun suite. Either 1 extra king size bed (220cm x 220cm) or 2 king single beds. The Jepun suite with enclosed ensuite bathroom and non-slip tiles and roll in shower. All guest suites have quality linens and a free gift. All guest suites have a safety box. Walk the quiet roads behind Angel House. Sandat suite. Private entrance and veranda with table and chairs for Sandat suite. Lumbung suite with AC, fan and ensuite bathroom. Cool, clean, deep (1.6m) pool with swim-up shelf and wide sandstone steps. Sandat suite private entrance and veranda. Sandat suite with pool and garden views. Local tradition market. Try local specialities! View to bale from Jepun suite. Jepun suite with private entrance and own veranda with chairs and table. Walk the quiet village streets.